This is one of the most common styles used for Decopatching. 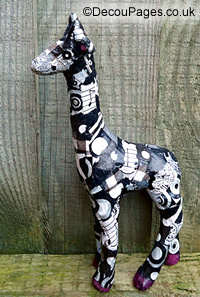 Roughly square or rectangular pieces of Decopatch paper are used with only small amounts of overlap. For a very formal patchwork effect the paper can be cut into identically sized pieces. Alternatively the paper can be cut or torn into squares or rectangles, depending on your taste. Using a single paper design or a range of complementary papers, such as the terracotta themed design shown, are both popular options. This style is quite economical in the amount of paper it uses. This is a much less formal style. The Decopatch paper is torn into rough edged pieces. The pieces are not necessarily square or rectangular. Triangular and L-shaped pieces can easily be incorporated. Because of the uneven shapes it involves more overlap and so uses a bit more paper than the patchwork style. This style is ideal for kids as it doesn't require careful or exact placement of the pieces. Any gaps in the paper can be filled with small slivers of paper after the bulk of the object has been covered. Just as when you wallpaper a room, the idea is to have a seamless finish so the focus is on the paper design rather than the technique. 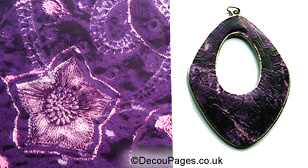 It can be used for small items such as jewelry using a carefully cut to size piece of Decopatch paper. This is also a popular style for covering larger items such as furniture. This style is easier to achieve when Decopatching flat surfaced items rather than complex 3D shapes. 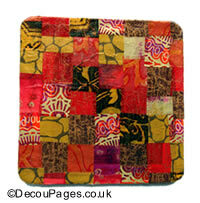 You don't need to restrict yourself to a single Decopatch paper. Just as a feature wall might be covered in a different wallpaper, using different Decopatch papers on different areas can look really effective. 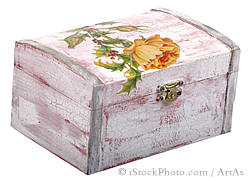 Chalk paints make an excellent base for the distressed look. Allowing some of the base colour to show through adds to the look. Using a nearly dry brush keeps the paint layers thin enough to see through. The brush strokes also add texture and interest. This look can also be achieved when covering the entire object in decopath paper. Affix the motifs or decopatch paper to the item but don't cover with glue-varnish. Use fine grade sandpaper to sand the edges and corners before applying glue-varnish over the top of the paper. Allow the background to show through between the paper pieces to imitate a mosaic. Using a simple cut out stencil can help with the layout of your mosaic design. 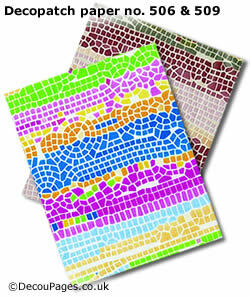 Alternatively you can cheat and use one of the mosaic design papers to give the look of a mosaic without the effort of positioning many small pieces of decopatch paper. Use black, grey or dark paper to form boundaries between areas of colour. It's generally best to choose fairly plain decopatch papers to avoid distracting the eye from the overall stained glass effect.